“The Vicker’s Gun was marvellous if you were mechanically minded”. It was based on an original design by the American Harim Maxim who supplied guns to all the warring sides. He became a naturalised Briton and lived in Kent. 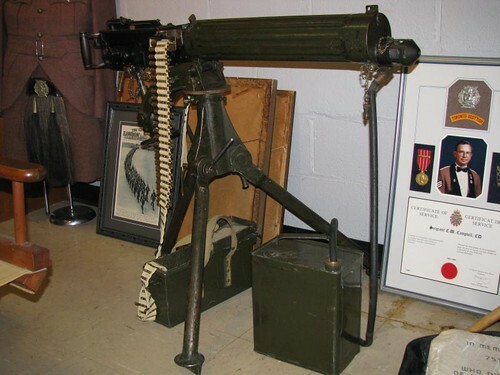 His Maxim gun was used by the Germans, the Vickers MK1-IV by the British. You could tell from the position of the crank shaft what was wrong. A good gunner could correct it more or less straight away. The belt came out of this bean hopper with the ammo; it jammed if it got wet. With a faulty cartridge you could adjust the spring two or three notches. I got a few day’s leave from Grantham before we left for France and then I didn’t get any leave whatsoever while I was out there through the Somme and Paschendale – about two and a half years of it. It was only when I came back to join the R.F.C. that I got any leave. Everyone was issued with these red plastic identity discs with your name and number on them. “I went and found a Jeweller’s and had one made up in silver to hang around my wrist”. We set off for France at midnight in March 1916. Grantham was a goods yard. Belton Park and Harrowby nearby were the camps for transport and twelve machine gunner companies. There were mules and officers’ horses and the limbers; a limber was a four wheeled cart or wagon. The camps held, at any one time, between 25,000 and 45,000 troops. This was the end of January or early February 1916. There were no paths so you were always stepping into the mud just to reach your hut. The mud as a joke; they reported that in the Camp’s Penny Pictorial and the local paper. The other joke which did the rounds was that once interred in Barrowby Camp the inmates never left their stay seemed so interminable. Belton Park had been offered to the military authorities when war broke out on the 4th August 1914. Since the 1880s local volunteers, territorial and yeomanry had used the park. At first they had bell tents but in 1915 these were replaced by rows of wooden barracks. There was a standard gauge railway line using a 0 4 0 track which ran into the camp carrying supplies. It moved extremely slowly due to the weight of the goods and the steepness of the gradient. Soldiers marched the two miles from Grantham Station. The Machine Gun Corps were based at Harrowby, the other side of Harrowby Lane immediately south of Belton. The food was ‘Bloody Awful.’ The porridge was dreadful. You’d leave it and you got the same stuff back the next morning.